Big-name publications like What Hi-Fi and Stereophile gave all sorts of accolades to KEF LS50, often calling them the world’s best bookshelf speakers. Made by a prestigious British manufacturer of audio equipment, the KEF LS50 speakers were inspired by the LS3/5A model which was used by the BBC back in the 1970s. If you’re not from the UK you may not know that the BBC is famous for using only the best equipment in their studios. Back in the day, the best monitor they could get their hands on was KEF LS3/5A; today, its successor is seriously heading to the top. Although it might not be ideal for professional studio use, there’s no doubt that KEF LS50 is a fantastic monitor speaker. It’s capable of bringing that ‘soundstage feel’ straight to your living room. Buying a KEF LS50 bookshelf speakers would mean taking your listening experience to a whole new level. If you buy them, these speakers are gonna show you a new world of audio that you never knew existed. They’re gonna provide you with super-rich sound, a kind that you probably haven’t have the pleasure to hear before. 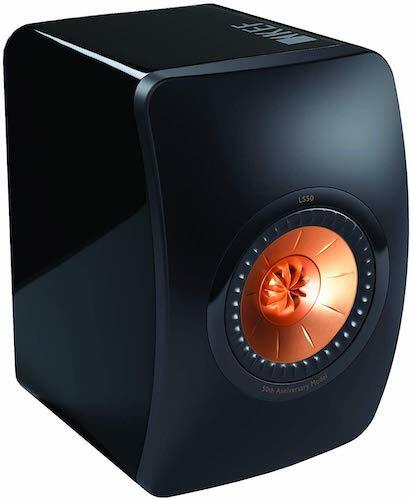 Sure, the main reason why we’ve decided to do a KEF LS50 review is that these speakers have flawless performances. But, this doesn’t mean that we can ignore the fact that they also look nice. And they ought to be, as bookshelf speakers are meant to be kept in the living room, where everyone could see them. If you place KEF LS50 speakers on the bookshelf of your living room, they’re gonna leave a powerful impression on your visitors. And it really doesn’t matter which color combination you choose, these speakers are guaranteed to look lovely. Speaking of colors, the currently available enclosure colors include the following: black, red, gray, high-gloss piano black, and high-gloss piano white. You can also choose the color of the driver wave-guard, which in some versions comes in Rose Gold color, in some it’s blue, while there’s also a black on black version of the speakers in which both the enclosure and the wave-guard are black. 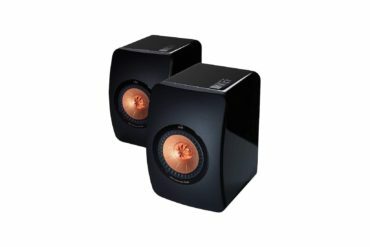 And thanks to the fact that the dimensions of each of the two KEF LS50 speakers are 10.9″ x 7.9″ x 11.9″, you will probably have no problems finding room for them. 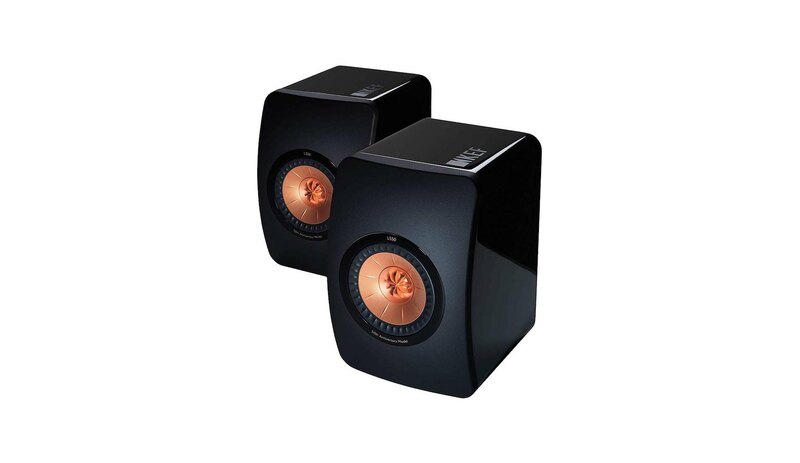 The combination of an elegant design and compact size makes KEF LS50 speakers a great choice for literally any room. It really doesn’t matter what kind of interior design you have in your home – chic, minimalistic, modern, or traditional – KEF LS50 are guaranteed to fit right in. To ensure that, you just need to pick the right color. Black is always in fashion, but the other colors are also pretty elegant as well, so whichever you pick, the speakers won’t stand out. They won’t stand out with their design, but you can be sure they will stand out with their audio performances! Don’t trust us? 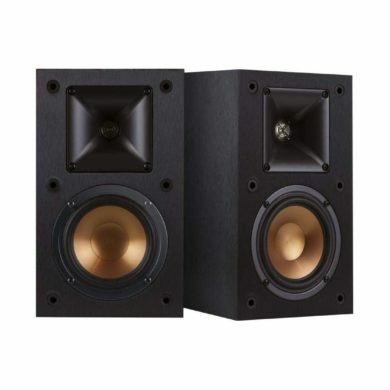 Then you need to take a look at the features and specifications of these bookshelf speakers! When it comes to performances of bookshelf speakers, the biggest complaint the users have is the bass. But, that is not the case with KEF LS50! 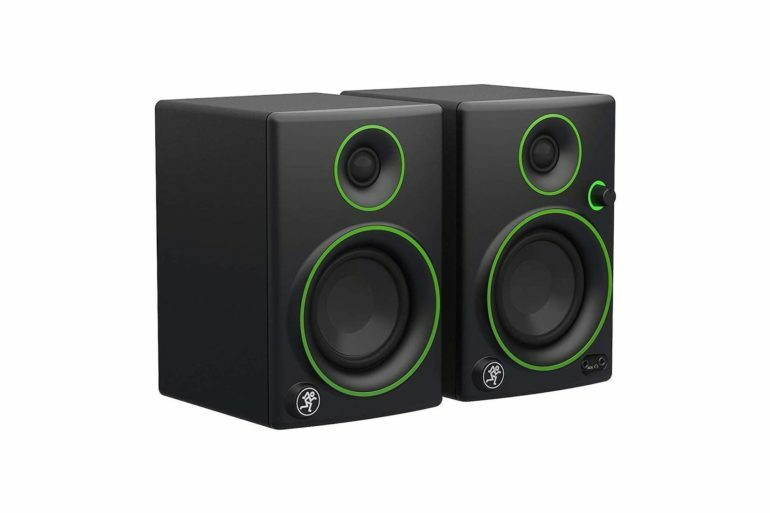 These speakers simply excel when it comes to reproducing low-frequency sounds. The bass is deep and powerful, which is rather surprising considering that the sound is coming from such a small set of speakers. But, the size apparently does not matter. At least in the case of KEF LS50, which are capable of creating bone-shaking bass, which still does not steal the show entirely. Instead, it keeps everything in balance. And that means that the mids and highs also sound perfect. The vocals are incredibly accurate, without absolutely no distortions. Uni-Q® driver – KEF engineers worked very hard to come up with a driver that’s gonna create fast and clear sound. And they’ve managed to do it. 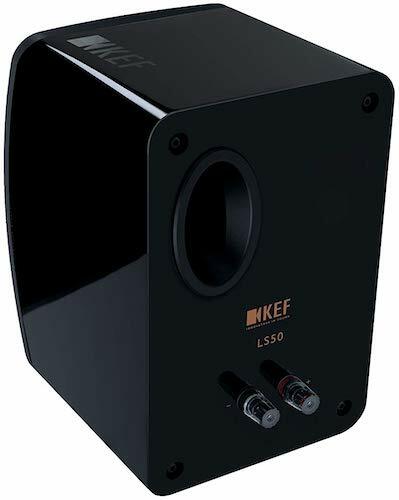 It’s called Uni-Q and is used in several speakers from KEF’s collection, including LS50. Why this driver is so special is that it’s made of a 25mm tweeter (aluminum dome) that’s placed inside a 13cm mid/bass (magnesium/aluminum–coned). Wave-guard – By looking at these speakers, you could think that there’s a grill covering the front of the tweeter. But, in fact, it’s a waveguide, the purpose of which is not only to make the design of the speakers more exciting, but also to boost the performances at high frequencies. Frequency range of 47Hz – 45 kHz – What this basically means is that it covers almost all the frequencies that the human ear can register. 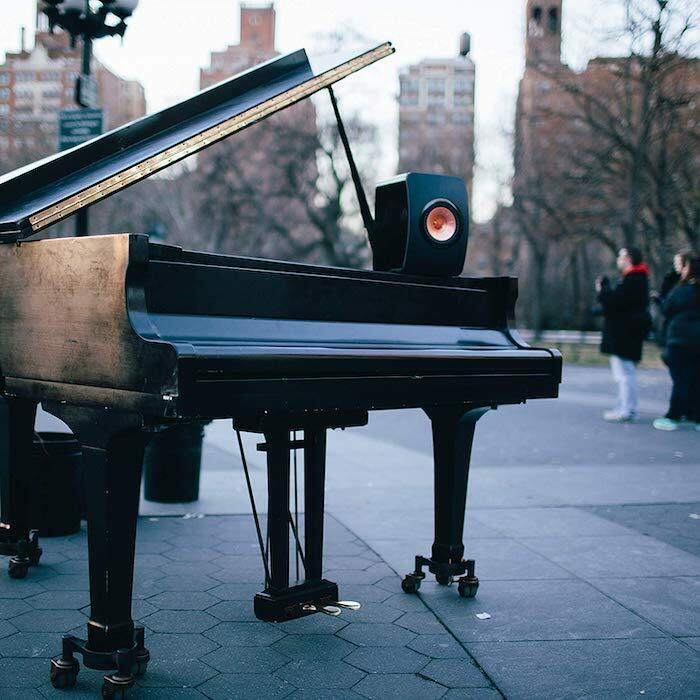 You can play literally any music and these speakers will be able to reproduce it flawlessly. DMC front panel – Take a closer look at the speakers and you will notice that the front panel is curved. And that’s not done by accident. The curved design is actually deliberate as it gives the speakers’ performances a boost. And the same goes for the material of which the front is made. DMC a.k.a. Dough Moulding Compound might be the ideal material for high-performance speakers as not only does it boost audio quality, it also makes them more rugged. MDF enclosure – Only the front panel is made of DMC, the rest is made of MDF, another fine-quality material. What makes it such a good choice is that MDF enclosures are great at lowering resonances. Flexible reflex port – One of the reasons why the bass created by KEF LS50 is so awesome is that the elliptical reflex port that tunes the bass is flexible. And because of that, there are absolutely no distortions when dealing with mid-range frequencies. Fantastic sound – If you’ve used only budget speakers so far, you’re gonna be shocked by the quality of sound created by KED LS50. 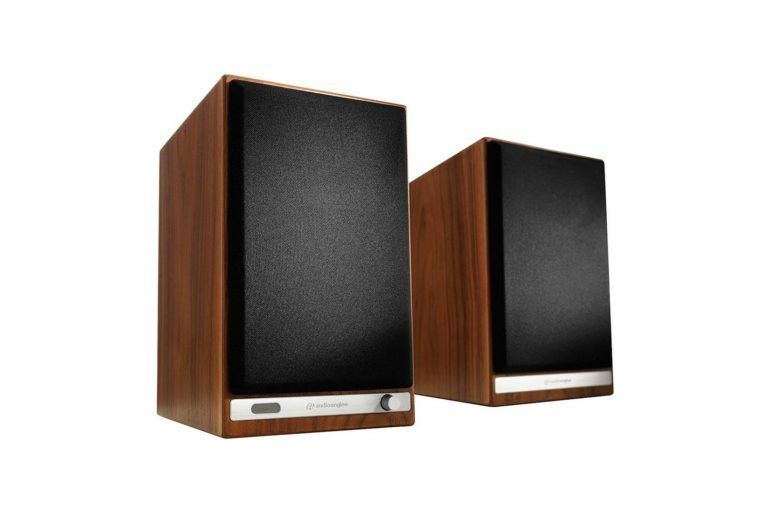 The performances of these bookshelf speakers are fantastic, regardless of the frequency. And considering their pretty small size, it’s really shocking that the bass they create is so impressive. Small size, lovely design – In terms of design, KEF LS50 are bookshelf speakers in true sense of the term. First, their size is pretty small, so you won’t have problems finding a place to keep them. Secondly, KEF LS50 speakers look pretty stylish, meaning that they won’t draw attention to them. Of course, only until you switch them on. Durability – These bookshelf speakers are made by a manufacturer that’s trusted by such reputable institutions like the BBC. They like KEF not only because its speakers create amazing sound, but also because all of KEF’s products are super-sturdy. And that, of course, includes KEF LS50 as well. These speakers are bound to serve you well for ages and even if something goes wrong, the manufacturer is obliged to repair it, under the condition that the problem has occurred during the first five years since the purchase date. Price – Many average users simply have no intention of spending more than just a few hundred dollars on a set of bookshelf speakers, nonetheless over a grand, which is how much you’d need to pay to get KEF LS50. But, if you’re not an ordinary user but a true audiophile, the price tag will not stop you from getting some of the best speakers in the world today. If you want to be sure that you’re gonna buy a good set of speakers, just buy one that’s made by KEF and you got nothing to worry about. This company has always been in the business of manufacturing top-quality speakers, so whichever model you choose, you won’t go wrong. Of course, as you’ve probably figured out already, our absolute favorite is KEF LS50. It has everything you may ask from bookshelf speakers. 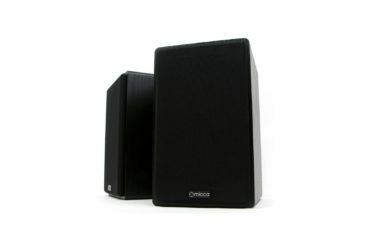 But, if you want to go one step further and get yourself wireless bookshelf speakers with a futuristic design, then you should go with LS50 Nocturne. Designed by Marcel Wanders, the speakers look out-of-this-world. And when it comes to their performances, they’re basically the same as in the case of the regular LS50 version, the only difference being that they’re wireless. And if for some reason you’re not a big fan of the British manufacturer, there are a few other brands that make fantastic bookshelf speakers. Our advice is to check out what Polk Audio (e.g. Polk Audio T15), ELAC (e.g. 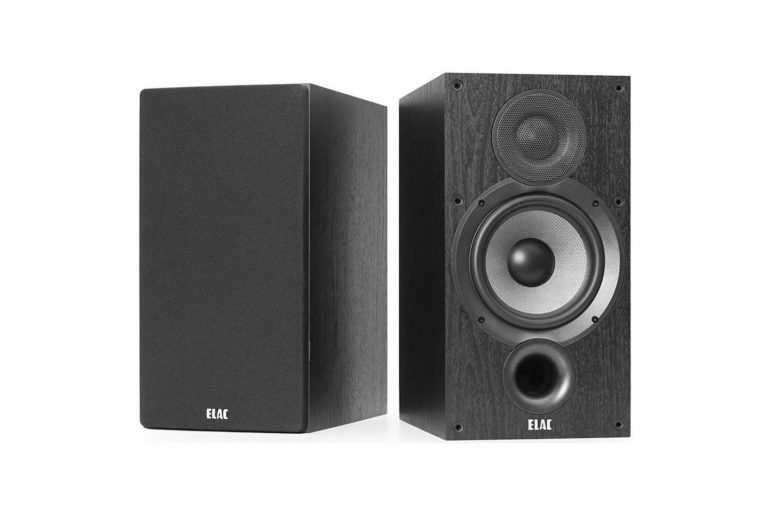 ELAC Debut 2.0 B6.2), and Edifier (e.g. R1280T) have in their offers. “I’m Not Rich Enough to Buy Cheap Things” – keep this proverb in your mind when you go shopping for bookshelf speakers. If you pay a little bit more and get a high-quality product, it’s gonna serve you longer than a cheap one probably would. When it comes to KEF LS50, it’s not just about the longevity. It’s actually more about the sound quality these speakers can produce. You can be sure that no cheap bookshelf speakers can provide you with such high audio performances as KEF LS50! So, if the music plays an important role in your life, why not treat yourself with a pair of bookshelf speakers that will take you to audio heaven?